Director of Toronto’s Contact Dance International Film Festival, Kathleen Rea, speaks with dancer Vivek Patel, upon the world premiere of his film “Contact Improv from the Inside Out” at the film festival on May 13. K: How did you first become involved in Contact Dance Improvisation? V: I started doing Contact Improvisation ten years ago. I was thirty-six when I started. I had been afraid to dance all my life, but inside I really wanted to. A friend of mine told me about Contact. He thought that because I do martial arts, it might be right up my alley. He said, “You know, there’s this guy who’s really friendly and really awesome and he’s teaching a workshop. His name’s Allen Kaeja. You should go check him out because even though I know you’re terrified, this guy can help you get over your fear”. And so I went to the workshop with Allen at Harbourfront, and I was just blown away by it. I’d never seen people move like that. I’d never seen people interact like that. You know, in the martial arts world, we pretty much punch and kick each other all the time [laughs]… I’d never been around people before being physical without that competitive nature. They were being cooperative and bonding, and it was just so beautiful. It touched my heart. From the very first day I was hooked but also terrified, because I felt like I was too old to get into something like that. But it touched me so deeply I couldn’t stop. K: What martial art did you do? V: I did, and still do, Ninjutsu, which is an ancient Japanese martial art. I was one of the first Canadians to study this martial art and I’ve been doing it now for almost thirty years. It’s a beautiful martial art that has a lot of flow. The principles are similar to Contact Improv, in terms of being in connection with the other person… connecting your own center to their center… feeling the connection to the ground and the strength and power the ground gives you. In both, Ninjutsu and Contact Improvisation, rather than trying to use muscle to force things, we try and use connection, flow, momentum, gravity, and relaxation. K: What do you think your fear of dance was based on? V: When I was very young, like maybe eight or nine years old, or even younger, I used to love to dance. And then one day, I had a few friends over and we were dancing in my living room. One of the kids started teasing me, saying “you dance like a girl”. Now, if somebody said that to me at this point in my life, I’d consider it an honour. But when I was seven or eight years old, it seemed like they were telling me I wasn’t masculine enough. I was being laughed at and derided for my dancing. I didn’t have any kind of emotional foundation to deal with that kind of insult at that age. One of the main reasons I’m so passionate about teaching conscious parenting workshops at this point in my life is that I want to teach parents how to give their kids the tools to deal with things like that so that they’re not so devastated by it. It closed me up for thirty years. I couldn’t even dance when I was alone in my living room. It seems irrational, but that’s how the mind works. My fear of dancing went so deep, it terrorized me. When I went to my first [Contact Improvisation] Jam, I was so nervous I thought I was going to throw up all over the floor. I just sat on the side of the room, watching. I didn’t even have the strength in my legs to get up. You actually came over to me and grabbed my hand and pulled me up onto the dance floor. You were the first person I danced with at a Jam. V: I’ve always been grateful to you for making that initiation on that first day. That’s one of the reasons I make an effort to go over to frightened-looking people myself and give them a gentle and welcoming dance as often as I can. K: What was it about Contact Improvisation that helped you get over your fear? V: To be honest I don’t think there was anything in particular about contact Improvisation that helped me get over my fear. In fact I found it quite terrifying. It activated a lot of my insecurities. In some ways it still does! I think the thing that really made the difference was that I just decided to keep going no matter what. I knew this was something I wanted in my life and I could feel that there was no shortcut. So no matter how afraid I was I just kept going every week. At first the fear would outweigh the joy, but I just kept going. Eventually the joy started to catch up to the fear and eventually overtook it. Now ten years later the fear occupies a very small corner of my brain. It is still there but doesn’t make quite the racket that it used to. These days when I leave after a couple of hours of dancing I feel happy, nourished and high. K: What has changed for you since you started dancing ten years ago? V: Hmmm… good question. It’s a question with a lot of answers. I think in my own personal self-development, I’ve learned to accept myself more. I’ve learned to accept myself in whatever state I’m in. In Contact, I’m finally starting to learn not to worry about how I look. Not to worry about whether something seems to be working out or not. But just to love the moment regardless of what it is. The more I love the moment, the more I experience and experiment. The more I play and become curious, the more joy I get out of it. This transfers to my life and transfers to my self-image, which is the thing that was damaged when I was a child. Also my physical capacity has increased dramatically as a dancer and as a martial artist. I am able to engage more with my daughter who is very athletic. K: Some might say you were already embodied as a martial artist. What did Contact Improvisation give you above and beyond, or in addition to, what martial arts gave you? [long, silent pause] Are you still there? The first thing that comes to my mind, most obviously, is that Contact Improvisation allowed me to express a deeper feminine side than martial arts usually does. It allowed me to be softer. My martial art is very fluid, but it does have the intent to destroy my opponent [laughs], I’m merging with them with the intent to rip them apart in some way. Contact Improv is decidedly not like that. It provides the opportunity to express my physicality without that violent side. Now, I do love the aggressiveness of martial arts, but being able to explore my softer nature in a dance is also valuable to me. I’ve been on a personal journey of developing my feminine side for many years. When I was twenty, I saw women as a collection of body parts and not actual human beings with hearts, minds and souls. That’s largely how men are conditioned. I’ve worked very hard to change. Over time I fostered a more feminist approach to politics and philosophy and my relationships with women. Although I was on a personal journey towards exploring the feminine I didn’t connect to my feminine side through movement until I started Contact Improvisation. And then when I brought that learning into my martial art, it just amplified how powerful I was as a martial artist as well….It has even made me be a better lover. K: How did you have the idea to make a dance film? When did that seed start growing? V: I was doing martial arts in the park last summer. This guy approached me out of the blue and told me he was a film professor at York University, and he wanted to film me doing martial arts. I said no, because I am camera shy when it comes to my martial art. But I said, “you know, I do this other beautiful movement form that I think you’d be interested in”. I pointed him toward the Contact community. He works with film and he uses chemical processes to create interesting colours and effects. 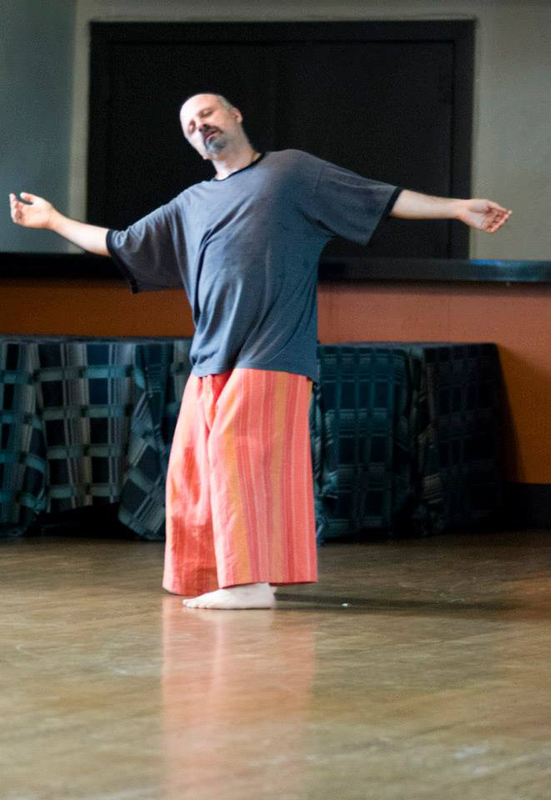 He wanted to include the Contact Improvisation community into his work. And so we organized a day to dance in the park and about ten to twelve people showed up to dance while he was filming. At some point, somebody mentioned that you were looking for submission to the Contact Dance Film Festival. The moment I heard that, the whole idea for a film just popped into my head. Another reason I love doing Contact Improvisation is that it’s connected me to a community of people that I care about and resonate deeply with. It’s given me a place that I feel is like home for me. So I wanted to honour and showcase that community and the depth that I see in these people who are my friends. I decided to give them a chance to express their authenticity and their relationship to this dance form. And so that’s where I got the idea to create a dance film where the people I dance with every week would write a piece of poetry that expressed how they experience Contact Improvisation and what the dance form does for them. Then they would dance while reciting their poem. This vision popped into my head and I knew I had to make it happen. I’d never made a film before. I’d done some filming and editing of wedding videos and seminars, but I had never made a film. But I just said to myself that I’m going to throw myself into this and do it. K: How did you feel when your film was accepted and to discover that your film was scheduled to be on the program with Allen Kaeja’s films? V: Yeah, for somebody who’s never made a film before I was thrilled and at the same time, I feel like it’s hardly just me that’s been accepted… it’s the community I represented. And I’ll tell you [laughs], when the Film Festival accepted my film, it was a conditional acceptance. The film was twenty-two minutes long and they said that in order for me to have my film in the Festival, I had to cut it in half. When I heard that, I nearly passed out. I couldn’t imagine cutting this work of art that I had created in half. The process of doing so was really, really hard at first. It hurt. But the more I did it and the more I had to change things and let go of things that I had thought were really awesome, the more I started to feel the difference between what was essential and what was extra. What was really necessary to express the message and what was more like the wrapper on the candy. And that process, although it was hard, taught me a lot. Since then I have started to work with that same feeling in my writing and even in my dancing. I’m trying to keep more of what’s essential and less of what’s just the wrapping. What is Contact Dance Improvisation? Contact dance improvisation is a social dance involving touch, in which momentum between two or more people is used to create and inspire dance movements. The form is similar to martial arts practices such as Aikido that use momentum and rolling point of contact in defensive actions. Contact dancers use these practices, not to defend themselves but to communicate, dance and express. In Contact Dance Improvisation there is no set lead and follow as is common in other social dances. The dancers will sometimes follow and sometime lead and interchange between these roles seamlessly. With no pre-set roles, deep “listening” and responding in the moment, to one’s partner, is central. Techniques include rolling point of contact, balancing over a partner’s centre of gravity, following momentum, and “listening” with one’s skin surface. Contact dance improvisation is accessible to people with no previous dance training and to people with physical disabilities. It is typically practiced in a jam situation in which a group of people gather to improvise together. These jams occur around the world and include people of all ages and training levels. Want to learn Contact Dance Improvisation? When I was five years old, I fell in love with Margery Williams’ classic story The Velveteen Rabbit. That year I asked for my very own velveteen rabbit for Christmas. At the time, stores only sold stuffed rabbits around Easter time. My mom searched high and low and finally found a stuffed rabbit for way more than she could afford in a Yorkville toy shop. I loved that rabbit into being real and it kept me company through the trials and tribulations of growing up. One could say that this production of The Velveteen Rabbit ballet has been in the making since I was five years old. But it officially began in 1999 when Bengt Jörgen asked me to create a ballet for his company Canada’s Ballet Jörgen. The Velveteen Rabbit was the first story that came to mind. I pulled my old stuffed bunny out of its keepsake drawer and asked the Ballet Jörgen prop builder to build a life sized version. I then worked for months choreographing the ballet and was able to see the stuffed rabbit come to life on stage. Last year, Bengt asked me to remount The Velveteen Rabbit. It has been an extraordinary gift to come back and reshape a work fifteen years after I first created it. I bring to the new production a wealth of experience and knowledge that my younger self did not have. I am now a mother of two boys and the eldest is almost five, which is the same age as the character of the boy in the ballet. When I explained to Daniel, who plays the little boy, how he should throw his housecoat in the air and gleefully run away, I smiled because I had just experienced a similar scene that morning as I was getting my son ready for school. The new production has more of a theatrical feel. I have been telling stories through dance over the past 15 years, and I have learned a thing or two. All the characters now have clearly defined back stories and plot dilemmas they are trying to resolve. I worked to create a relationship triad between the Nanny, the Velveteen toy and the young boy that speaks to the power of love as a transformational force. The Nanny gives the Velveteen Rabbit to the boy so he has something to hug when he is lonely. It is the Nanny’s love for the boy as realized through the Velveteen Rabbit that helps the boy’s heart grow bigger. He learns compassion for others and that the world is not all about him. The more the boy’s heart grows the more he is able to love the Velveteen Rabbit. His love starts to make the toy real. The more real the toy becomes in the boy’s eyes, the more the boy’s heart grows helping to make his toy even more real. The transformation that occurs in the boy and the Velveteen Rabbit is something they have to do together. Together they learn that becoming real can hurt because is involves having a heart big enough to take in both the joys and sorrows of life. It is the growth in the boy’s ability to care for and love another that ultimately conjures up the toy fairy who turns the Velveteen Rabbit into a real bunny. Yes, I know that is a whole lot of depth for a ballet created for children! But I believe that kids have more emotional depth than we often give them credit for. They might not be able to name the concepts portrayed, but it is my hope that the story of becoming “real” in one’s heart will live in their hearts. They may actually understand the story better than us adults because the magic of toys becoming real is something they know to be true. My most recent choreography project is Ballet Jörgen Canada’s The Velveteen Rabbit. Growing up, The Velveteen Rabbit was my favourite story. I think as a young child I understood that becoming “real” is a sort of magic that can happen to all of us when we truly engage in life. I even had my own stuffed velveteen rabbit that I “loved” into being real. 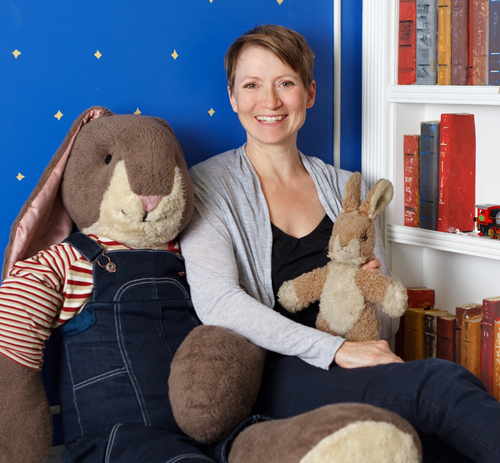 Years later when Bengt Jorgen invited me to create a children’s ballet on his company, The Velveteen Rabbit was the first story that came to mind. I asked my costume designer to use my old toy as a model for the lead dancer’s costume…and so my childhood toy did actually come to life! As a mother of two young boys, I am excited to create a ballet version of my favorite story that my boys can enjoy and learn from. Working in Toronto during the last year, Kathleen Rea, an expressive arts therapist, author, contact dancer and choreographer, and Brad Johnston, an embodied life coach and contact dancer have been developing an approach to working with people in relationships using principles of contact improvisation. We developed our approach through a process of dancing together and talking about our dances. Coming from a coaching and therapy perspective, we both notice that simple movement dynamics involved in lead and follow and giving and taking weight were metaphors for what was happening in our growing friendship. We both became curious about how contact improvisation could illuminate relationship dynamics and facilitate learning for couples. Through a workshop called “Relationship in Movement” people in relationships – ranging from life partners to newly formed romantic relationships – are led through contact improvisation exercises. Participants are often asked to take on clear roles such as leader and follower and then asked to switch roles. The simplicity of intention and clarity of roles invites people’s relationship story to quickly come to the forefront. In one workshop, a woman married for twenty years commented on how hard it was for her to follow her husband and how easy it felt to lead him. Her husband started laughing and said that’s because you’re always in charge. As they continued, they had the chance to practice and gain comfort with the lead/follow roles that were less familiar to them. The couples are invited to dance without talking and with minimal eye contact so the greatest amount of body sensing can occur. The feelings brought up through the movement are then shared verbally through non-violent communication methods that encourage listening and reflecting back what was heard. Conversing about their dance experiences gives people a safe way to discuss what might otherwise be very loaded issues of power and control. For example, rather than having their usual argument about finances, a couple can instead dance together. The power dynamic at the heart of their conflict will likely show up on the dance floor and can be explored through movement and verbal discussion about how the dance affected them without ever having to mention the heated topic of their shared bank account. Instead of rehashing their usual argument, they are working with the relationship dynamics that underlie the argument. During our co-facilitation of the “Relationship in Movement” workshops, we make sure to demonstrate each exercise. We aim to be present so that our improvisation demonstration is alive with our “real life” relationship issues. This transparency lets participants witness us working on our friendship and co-facilitator relationship in real time on the dance floor. In our society, touch is often sexualized and all about performance (i.e. pleasing your mate successfully). Through the workshop, participants experience touch and dance simply for the sense of enjoying moving and feeling their partner. Many romantic couples tend not to move together in ways that are intimate but non-sexual and not related to performance. Through the workshop, the role of touch within their relationship can expand. They can then find satisfying ways of being with each other physically that might have been previously unavailable to them. One of the exercises in the workshop involves one person lying on the floor while their partner practices draping themselves over. We then teach the person lying down how to redirect weight back to their partner and how they could do this at any point in the draping process. We tell them that this technique lets them communicate through movement: no, not now or yes, now is good. As they progress and switch roles, it is beautiful to witness their trust and playfulness in practicing clear physical communication. We believe that practicing new relationship dynamics in a dance has a carryover effect. For a person who has a challenge saying “no”, practicing clear physical signals in a dance and being encouraged to do so by a partner can increase his or her ability to say “no” in everyday life. We also believe that repetition is an important factor in establishing a new pattern. Participants are encouraged to name the elements of contact improvisation that stretch them emotionally. For someone who has a deep fear of abandonment, this could be the ending of a dance when the couple is called upon to separate and find their own space. Participants are asked to practice these moments with their partner in self-designed contact improvisation exercises that provide a chance for them to repeat and gain familiarity with the triggers that they have identified. In “Relationship in Movement” workshops we have held thus far, we have worked mostly with people in romantic relationships. As a next step we want to explore how these methods can facilitate learning in different types of relationships. For instance we plan to run a family series for parents and their adult children. This article was written by Brad Johnston and Kathleen Rea. Please note, details of the personal stories told in this article have been adjusted to protect the confidentially of the workshop participants. This is a video of my three and a half year old son and I dancing Contact Improvisation. 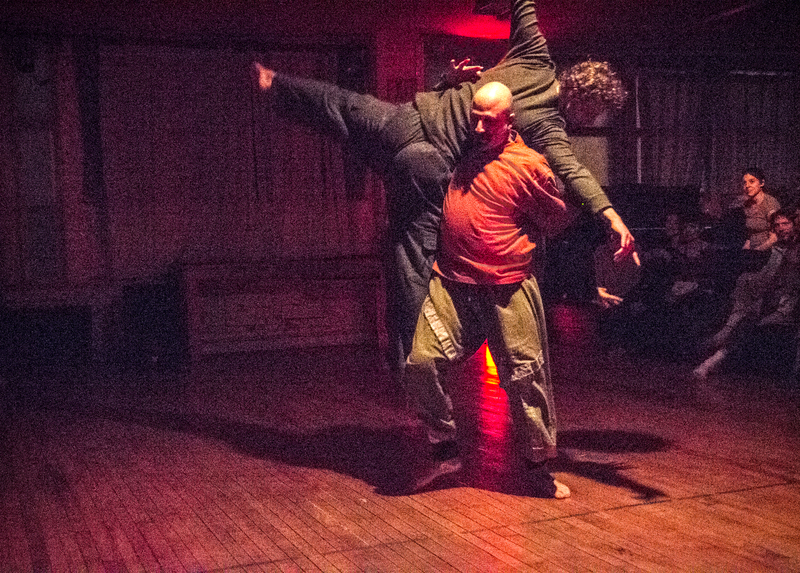 Contact Improvisation is a social dance involving two of more people in which momentum is used to create dance moves. It shares similar principals to martial arts practices. This past Wednesday was officially a heat wave. There was no air conditioning in the studio and it was hot! Yet 19 people still showed up to the Wednesday Contact Jam. Due to the heat my son who usually moves around at the speed of a whirling dervish was moving slow enough to actually catch on film! And how rare that my husband had our camera with him to do so. I think the fact that Wyatt’s dad is filming is also an integral part of this video. There are moments when Wyatt looks at the camera (his dad Jeff) and is so comfortable and happy. Jeff is also a contact dancer and used his dance skill to dance around us and with us as he filmed. So really this film is about a family dancing together. I also enjoy how through much of the video Wyatt is gazing at the musicians fascinated with what they are up to. I hope you enjoy the video as much as I do! 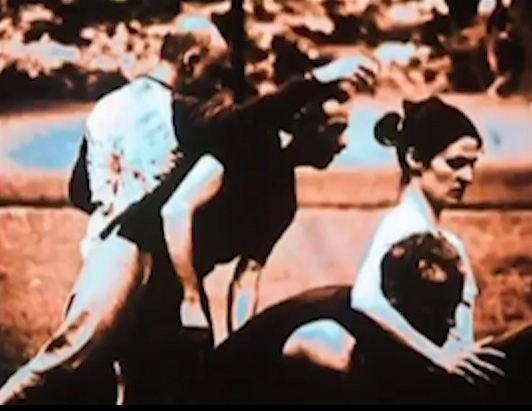 Filmed at The Wednesday Contact Dance Improvisation Jam, Toronto, Canada, July 2013. I think spending $1600 on a dance video project that helps the IRS employees boost moral is well spent money. A stress relieving dance project like this probably reduces health insurance spending and number of sick days logged and is therefore very cost effective.